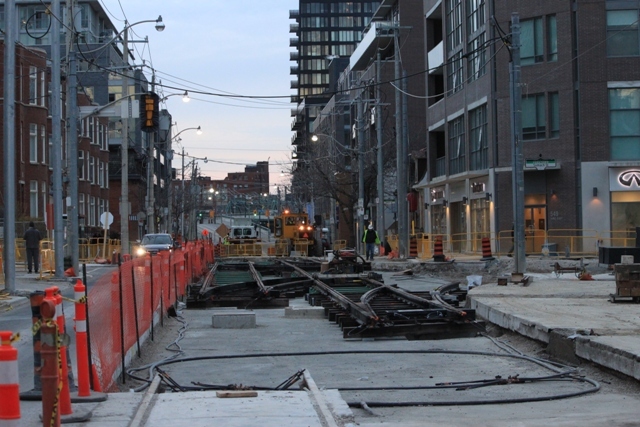 Last year, the TTC built new track on Cherry from Eastern Avenue south to the rail corridor that, eventually, will host a new streetcar service in spring 2016. Why so long you ask? 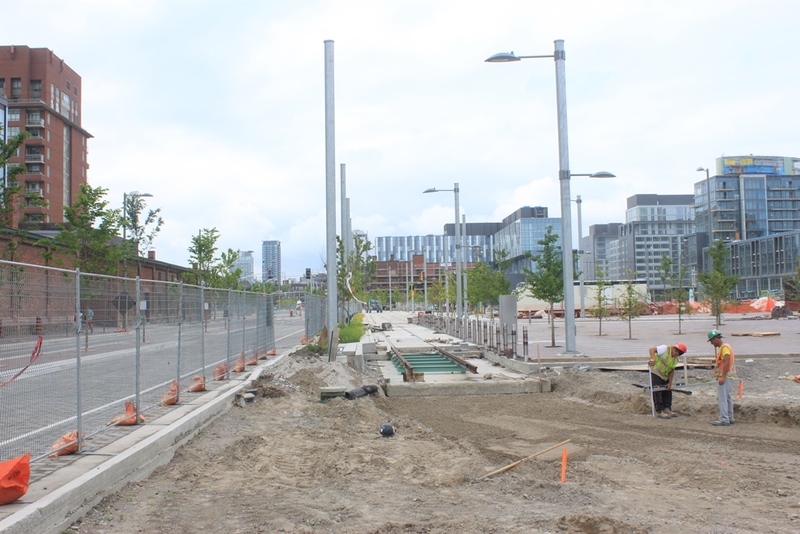 The south end of the line sits in the Pan Am Games’ Athletes’ Village and won’t be ready for service for two years even though most of the track will already be in place. The opening will co-incide with the period when purchasers of condos (originally used as athletes’ quarters) will start moving into the neighbourhood. New photos will be added to the end of this article as the project progresses. A reader asked whether someone would be brave enough to take a photo from one of the overpasses. Here is one provided by John F. Bromley from September 19, 1964, taken when the then Duke Street (now Richmond) ramp was under construction. Looking west on King across Sumach. The base that will lie under the foundation slab is being prepared in this view with work only about half-way across the intersection. Looking north from Eastern toward King showing what will become the streetcar right-of-way. 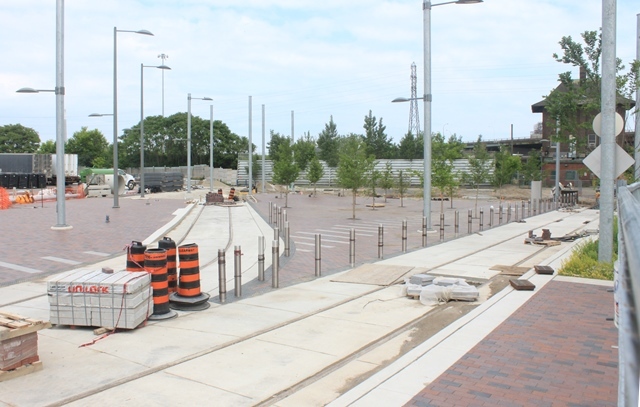 As on Cherry further south, the streetcars are on the east side of the street echoing the design on Queens Quay (to which this line may eventually connect) where the tracks are south of the road lanes. Two panels that will form the western quadrant sit on trailers further west on King. Looking south on Sumach toward Eastern, the reverse angle to the second view of April 17 above. Some preliminary grading has been done in the interval between the two photos. 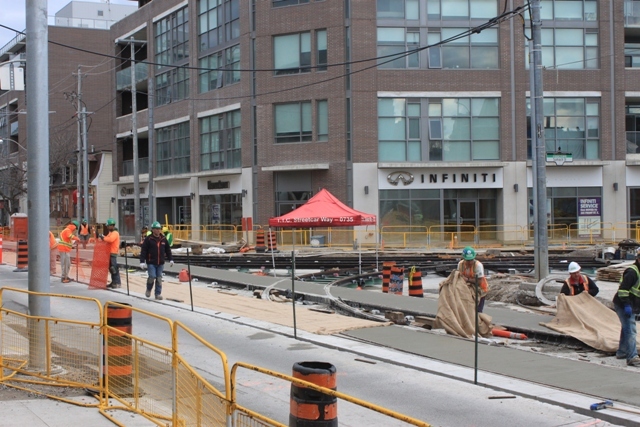 Both quadrants of the intersection have now been installed on King Street. Looking east across Sumach on King. Looking west across Sumach on King. Most of the south quadrant is now in place. However, a chunk of the east to south curve is missing because of utilities (including TTC feeders) that have not yet been relocated. Looking southeast across the King & Sumach intersection. The TTC pole carrying feeders is located on a small island that was to be removed as part of this project (see plan below). The same feeders are also visible on this island in the 1964 photo above. Another view looking south on Sumach across King. The small red brick building in the background is a TTC substation from which the feeders running up that pole likely originate. Here is the design for the intersection as originally published in the Cherry Street project’s plans. It clearly shows that the east-to-south curve would pass through the island that has not yet been removed from the street. Dundee Kilmer (DK) is in the process of finalizing items related to Cherry Street and hope to have it reopened by the end of the month. This may need to take place in stages. The section from Mill to Lake Shore is expected to open imminently. As you mention, Metrolinx is undertaking bridge repair work. Until there is a continuous pedestrian route on the west side of Cherry St, the street needs to remain closed. We expect that this should be resolved very soon and the section from Lake Shore to Mill opened. The remainder – from Mill Street north to Old Eastern Avenue – is contingent on DK finalizing the remaining items with the City. We expect that this portion will also open shortly, but we don’t have a firm date yet. 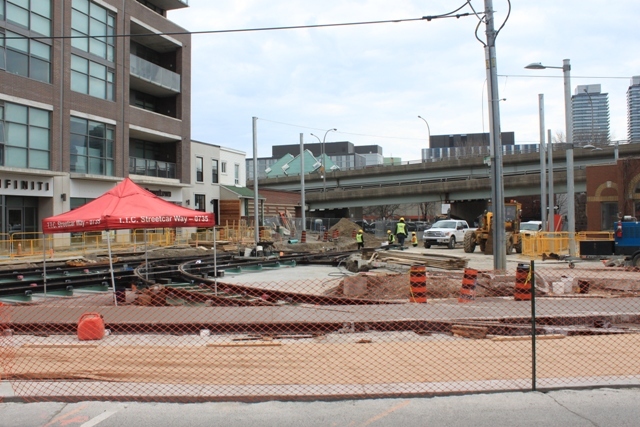 With luck, once Cherry re-opens south from Mill, the 172 Cherry bus will be routed through the Distillery District again rather than around it. 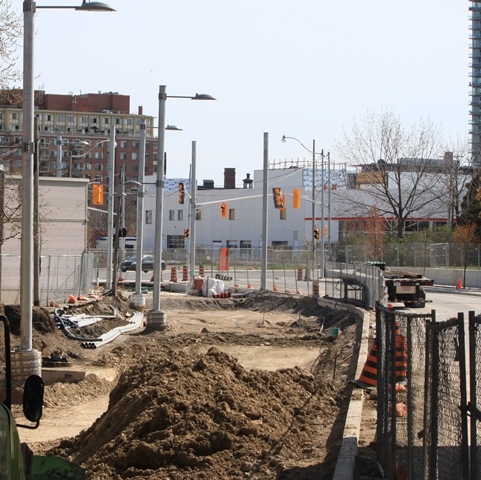 Excavation continues for the new track on Sumach linking south from King to Cherry, and the feeder cable which rose on a pole that conflicts with the new east-to-south curve has been moved to a new location. Looking south to Eastern Avenue on Sumach. Connecting in the new feeder on the northwest corner of King & Sumach Streets. 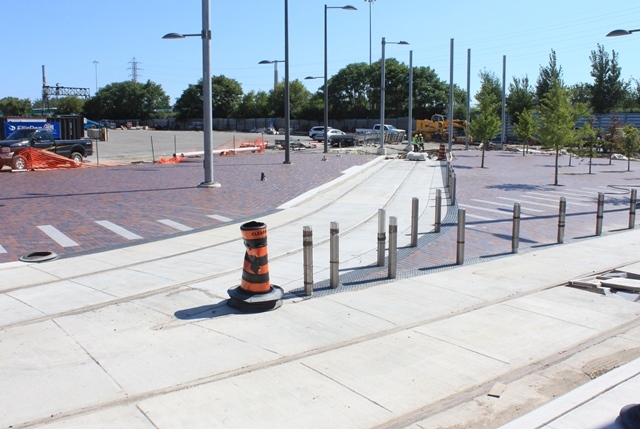 The remaining piece of the east to south curve has now been installed, and work continues elsewhere in the intersection to finish off the sidewalks. On Sumach Street, preparations for the foundation slab are underway. Looking north on Sumach toward King Street. 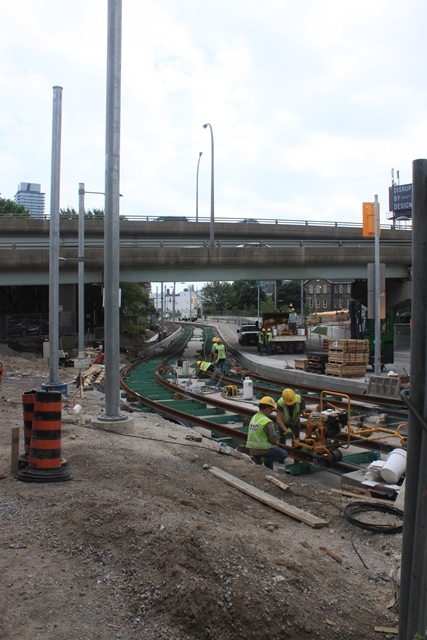 The last section of tangent rail is now being installed between King and Front Streets. Looking north from Front toward King. Looking south from King toward Front. 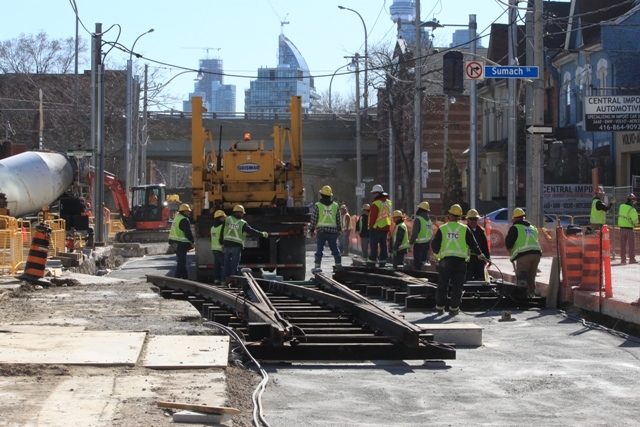 Also, despite contrary plans announced earlier in the project that the loop at the rail corridor would not be completed until after the Pan Am Games, the TTC seems to be preparing to install the rest of the loop track now. Looking south on Cherry across the future loop with the Cherry Street Tower (originally the site of signal and switch controls for the eastern part of the Union Station rail corridor) in the background. 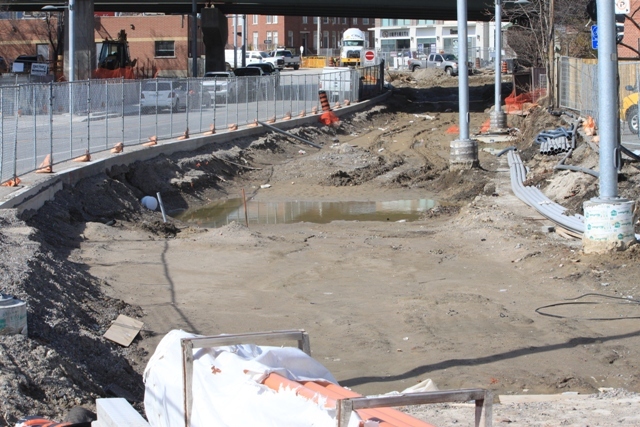 Looking across the bottom of Cherry Street Loop showing the excavation for the foundation under the loop track. Looking north on Cherry from the loop. 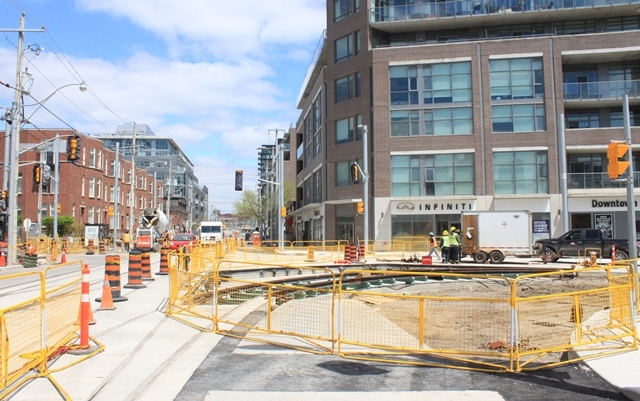 Although the original word on Cherry Street Loop was that it would be left incomplete until after the Pan Am Games, that plan is obviously changed. 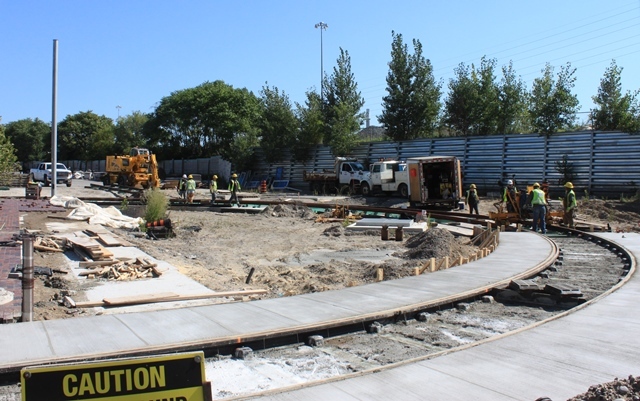 The remaining half of the loop was installed last week and (thanks for the info to David Crawford) the final concrete pour was done on September 20. The photos below were taken on September 17, 2014. The land east of the loop will be used for bus storage during the Games. It is intended, eventually, to be the site of a new school. For those unfamiliar with the area, the embankment in the background is the GO corridor and Don Yard east of Union Station. Cherry Street Tower is immediately south of the loop. The water tower in the distance in the middle photo is at the Unilever site east of the Don River. This entry was posted in King Car, Transit, Waterfront. Bookmark the permalink. You Tube link showing new streetcar on a test run turning King WB to Spadina NB. Steve: This video fails at about the half-way mark leaving the car stranded part way through its turn. LRT demolition derby! Coming to Tronna soon (I hope)! We’ve had street based rail transit in Toronto for over 100 years. It strikes me that the general populus of this city has gotten used to it. Nevermind that so many of the accidents in that video could have been prevented by a simple blind spot check. Whether it’s a streetcar, auto, delivery truck, or municipal bus, the result would have been similar. Great video though. Hope the fools in it don’t make the same mistake twice. Steve: The accidents shown in that video are the same as we saw in Toronto on Spadina where the barrier between streetcars and autos did not prevent conflicting left turn movements. I am not surprised that Houston had problems, although the video is clearly being used as an anti-LRT piece generally. If you design things poorly, then you get poor results. I want to see one of these new LRV’s (eastbound) do a right turn onto Sumach/Cherry St. with the pantograph extended (no trolley pole). By the way, it is May 12. Steve: That turn is actually not as tight as some regular 90 degree curves on the system which the new cars have already been around many times. I have heard, though have not seen any actual research, that a median LRT system that operates opposite-hand to the vehicle traffic substantially reduces the accidents shown in the video where people turn in front of an LRV. Think about it: if the median LRT were running left-hand in the middle of a right-hand road, anyone making a left turn would not likely turn in front of something coming at them they way they do when the approaching LRV is behind them. Steve: Where the problem lies is that if the “LRT” ever makes a transition to street running, counterflow operation won’t work. This is a design that has specific applications, but it’s not a cure-all. “I have heard, though have not seen any actual research, that a median LRT system that operates opposite-hand to the vehicle traffic substantially reduces the accidents shown in the video where people turn in front of an LRV. The other problem occurs with pedestrians who are crossing the street and right of way. They are expecting all vehicles to be coming from their left until they reach the midpoint, WHAM, no more pedestrian. The problem lies with the design of the road allowance that has street cars and left turns permitted on the same aspect of the signal. The US NTSB or FRA will probably solve the problem by requiring full quadrant crossing gate and a train horn blowing long, long, short, long. They already do this on some lines. It is no wonder that locals object to LRT because of all the horn blowing and gate bells. I had to watch the video from San Antonio again to check out what exactly was going on with the automotive vehicles that were hit by the LRT vehicles and from what I can tell, in pretty much EVERY SINGLE CASE, the drivers of the *automotive* vehicles were at fault, either from trying to race ahead and turn left directly in front of the LRT purposely, just “forgetting” the lane to their left wasn’t empty or because they appeared to have run a red light (raced through a stop sign?) on a cross street?! I also love the “Would you fly if an airplane crashed every 12 days?” straw man argument. Statistically, it has been much less safe to travel by car/truck/van/SUV, with 0.5 deaths per 100 million passenger miles in 2010. On the other hand, according to a recent New York Times report citing MIT stats, a person flying *daily* could do so for 123,000 years without being involved in a fatal accident). Scare tactics without actually considering facts and blaming inattentive/reckless drivers seem to work great on this video to dissuade folks from accepting LRT – I wonder if they’d want to show all the car-on-car accidents in San Antonio and get rid of them due to the danger posed? Anyway, thanks for the space to vent! The other factor they do not mention, is would you rather have been in that LRT at the time of the driver stupidity, or the car. The one thing I noticed is that in all cases the forces apparent on the LRT were trivial. Thanks I would rather ride the LRT, as the accidents they are in appear to be of no consequence to the rider, and Darwin may have his way with the drivers. Should design be undertaken to minimize this, yes certainly, appropriate lights and an actual curb would have eliminated many of these collisions, others are just accidents that would have involved another vehicle had the LRT not been there (running reds). Toronto, (and the rest of Ontario) needs better red light enforcement, as does apparently San Antonio. Someone made a quip about no streetcars for Scarborough? Isn’t there one supposed to be built from Rob Ford’s house to the place he’s supposedly receiving rehab from? Heard it was supposed to be called the Cracktown Rocket. Steve: The Cherry Street line is NOT Pan Am Games related because there are no venues, other than the Athletes’ Village, down there. The line has been part of the ongoing studies by Waterfront Toronto (all available on their site) regarding the Queens Quay East, Port Lands and Cherry lines (referred to by WFT as East Bayfront, Port Lands and West Don Lands respectively). 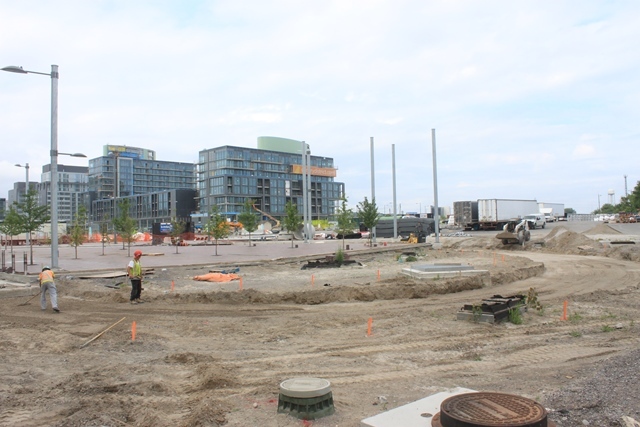 There is also a more recent scheme to extend track south on Broadview and then west to connect with the East Bayfront route and serve the Unilever Site where a very large commercial development is planned. In some of the more far-fetched plans, track is shown on Commissioners going over to Leslie where it would connect to Leslie Barns. Whether this will ever be built depends on the timing of development in this area which is at least a decade in the future. At one point, the TTC showed a service coming into downtown from Kingston Road via this link (it even had a route number), but I doubt we will ever see this. For the initial opening of the line on Cherry, which won’t happen until Spring 2016 once the games are out of the way, the terminus will be just north of the rail corridor where the loop is already partly built. Steve, how often do the working managers of the TTC, Toronto Traffic, parking enforcement and district police captains sit down. Is there a working committee, in terms of transit, traffic management, parking enforcement and policing, or are they managed as completely independent silos? If not has any actual council member, or candidate undertaken to push the idea of a committee for a more effective management of roads? Steve: I don’t think such a group exists. If it is any consolation, even members of council have reported problems with getting the police to take traffic management seriously. Absolutely true, but sadly the accident will be recorded, like all accidents, in the category of the higher-order vehicle involved – LRT in this case. On December 8, 2005 a 6-year old child died when his parents car was involved in an accident in Chicago. This was not recorded as an automobile accident because it was Southwest Airlines Flight 1248 that hit their car when it overran the runway at Midway Airport. It’s possible that this child may have never flown on an aircraft in his short life, but officially, he died in a plane crash. Accidents ought to be categorized by the vehicle at fault, but I don’t suspect that will ever happen. The closest thing to this is probably Karen Stintz’s campaign proposal for Transportation for Toronto with Transport Czar. I’d have a little more confidence in that proposal if she’d called for a transport integration committee during her time as TTC Chair, rather than spending time on her “One City” proposal. This is too bad, as the point has been made by you that the changes we do not really notice are the ones that make the largest difference, and Steve has repeatedly expressed frustration with regards to lane exclusions and turn restrictions being ignored. I am of the opinion overall that Toronto needs to get a larger transit share (allocate more road to transit) beyond the core, and better movement everywhere. To do this, the TTC really has to be the better way. That means better management/allocation of resources both inside and outside the TTC. King Street has now (Friday 4pm) reopened to two-way traffic. Sumach remains closed but looks as though it will reopen very soon. Northbound Sumach is now closed from King to Eastern. They are busily laying the missing block of track and the northbound lane is supposed to reopen on 28th. Steve: Thanks. Things looked like this was on the verge of happening when I visited yesterday. Though they initially said they would NOT be finishing off the loop just north of the rail bridge until after the Games they were working at it today. Currently they are excavating for the bottom layer of concrete but it’s not clear yet whether they will keep going and lay the rails too. Hard to keep up with the changes! It would’ve been great if the bollards on the loop were bike parking racks instead. Why not make infrastructure doubly useful? (I mean, put them a little further inside the loop for safety, but they’d still have the desired effect). Steve: I will have to check with Waterfront Toronto so see whether any design work for this area beyond its short term use for bus parking has actually been done. There will be a need for cycle parking at various points in the Canary District because of buildings that are likely to attract that type of trip. I hope they’ve left enough clearance on the winding section of track to let two vehicles shuffle past each other! The 172 bus has returned to Mill Street turning to/from Cherry Street by the future Cherry Street streetcar loop. I was on the bus today. The lanes under the Cherry Street bridge appeared to be very narrow causing the bus driver to go slowly. Parked cars on Mill Street made it difficult for two 172 buses to pass in opposite directions. There were temporary cardboard TTC bus stop signs at the Distillery District entrance. Perhaps the permanent signs were removed sometime ago. Nonetheless, there were passengers waiting at the Mill Street stops for the bus. The TTC has decided to put the 172 (partially) back on diversion until the Cherry Street bridge work (Metrolinx) is finished. Lane restrictions on Cherry Street do not allow for two-way bus operation on Cherry Street, north of Lake Shore Boulevard. I also noticed today that there are signs on the transit shelters on King east of Parliament saying that the 504 diversion around the Don Bridge will go on until ‘late November’. Of course the TTC website still says “end of August”. Clearly there are silos within silos at the TTC – the notice guys don’t talk to the web guys!. 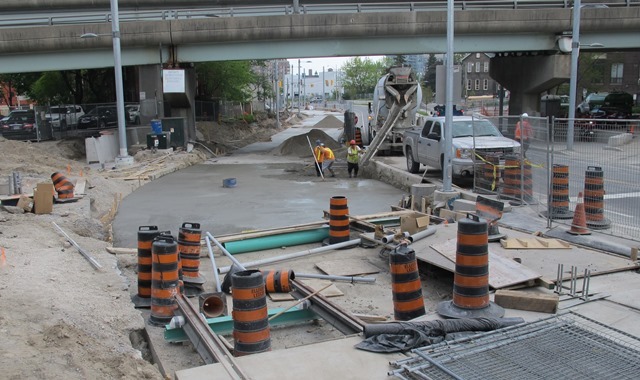 The track on Sumach from King to Eastern has now been encased in the top layer of concrete. It’s all sitting behind the fence and there’s still some minor work to be done a few pieces of land east of the tracks. It also lacks overhead, but given the service isn’t supposed to start until 2016 I’m guessing the TTC is punting that particular capital expense to a future fiscal year. 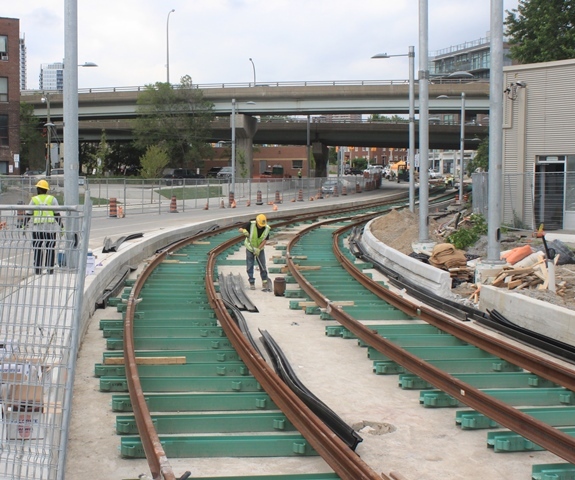 Steve: Also, the loop at the south end was not complete when I visited earlier this week. I live near Cherry Street, and have gone on half a dozen or more photo excursions to photograph progress on the line. I haven’t been able to get as close to the action as you have — at least not without trespassing. Do the construction managers allow you access to take your photos? I put all my photos in the public domain. Are you interested in having me send you the URLs to some of them? If construction managers do allow you behind the lines would you consider asking them if you can bring a second photographer the next time you come to Cherry Street for a photo excursion? Steve: All of my photos are taken from outside the construction zone. It’s amazing what you can do with holes in fences, holding a camera above a fence and a telephoto lens. Cherry St. remains closed from Mill to Eastern Avenue. The City pointed me to Waterfront Toronto, who say this is Dundee-Kilmer’s responsibility. Dundee-Kilmer say Infrastructure Ontario is to blame. Still waiting to hear what the latter has to say on this topic. Meanwhile, both pedestrian and vehicular traffic remains severely inconvenienced by this ongoing closure while the game of who’s on first continues. Shameful. 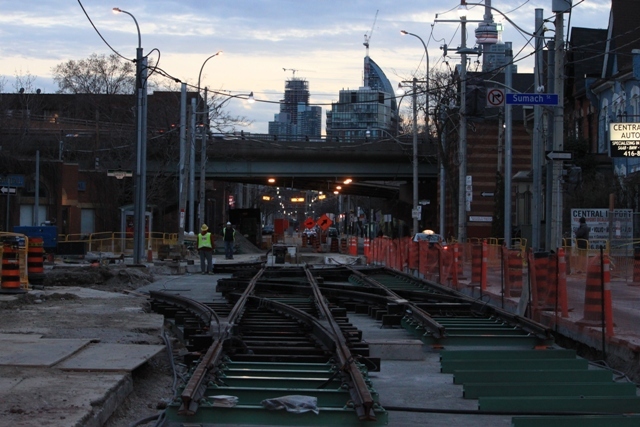 There is a photo on UrbanToronto today of the remaining track partly installed at the loop; good to see they have decided to finish it off. 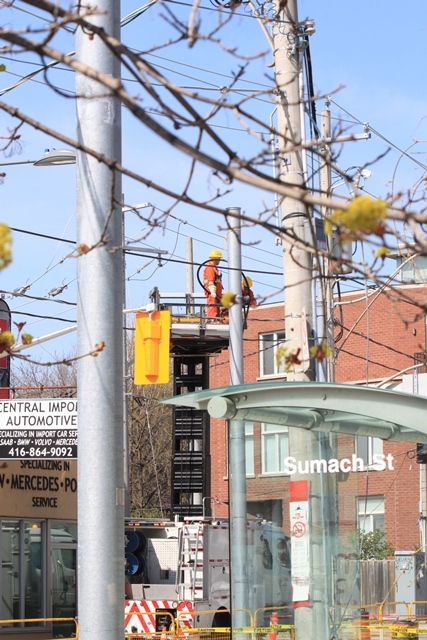 The TTC have also just started to reinstall the overhead on King Street from west of Sumach to the bridge; I assume they will do the King/Sumach intersection but not put overhead on Sumach-Cherry until after the Pan-Am Games. Steve: Yes, definitely good to see. I have been keeping an eye on the loop, but have not been there for a few weeks. Is Cherry Street still closed? 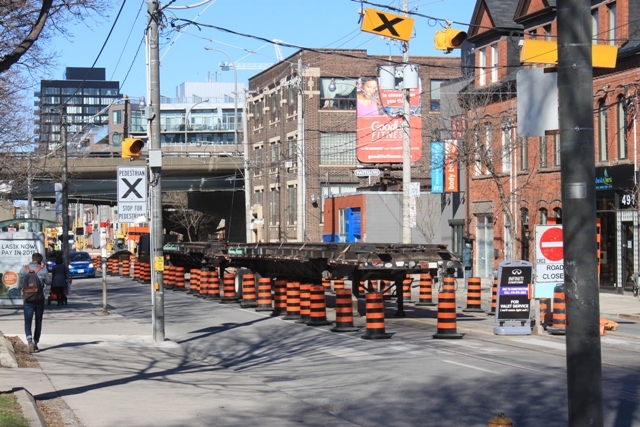 Steve: Yes, the block north of Mill Street remains closed because of some problem between Infrastructure Ontario (the agency responsible for the Pan Am Games development) and the City of Toronto. I went by the King and Sumach intersection a couple of weeks ago and the one thing that stood out was the incredible number of poles at the intersection. Every single city department has to have their own poles and sometimes multiple ones. It’s absolutely terrible. Steve: Yes, the pole clutter at some locations in town is getting quite annoying. Have they decided what line is going to run along Cherry Street? Steve: No, but a supplementary King service say from Dufferin would make sense. 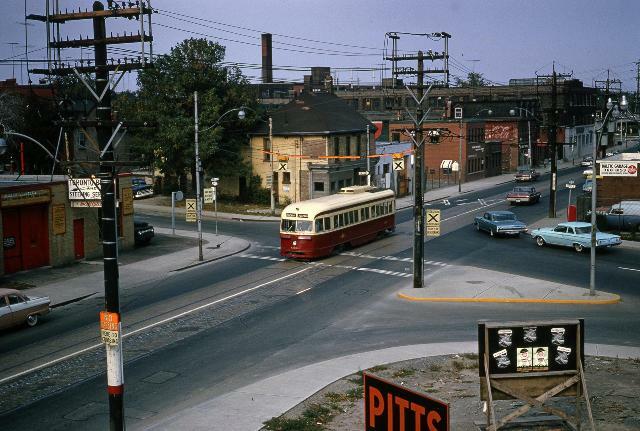 Of course, knowing the TTC, they would all short turn at Bathurst and at Church. It’s too bad the TTC didn’t have a better idea of the planned routing before they constructed Cherry St. (unless they do and aren’t sharing with us). If they went with the notion of ‘Transit to Cherry street is a good idea, let’s do that’ they might have not seen the opportunity to improve the interface with the existing network (any benefit to a very short extension up to Queen?) With shovels in the ground to undertake the bulk of the line, a bit of extra work doesn’t seem like a big deal whereas if it is found that this would be beneficial after the fact, adding it in is a big deal. Steve: The intent was always to provide a link so that cars could operate from Cherry to downtown via King, with an alternate option of a service to Broadview Station. King Street East has heavier demand than Queen thanks to the amount of development in, broadly speaking, the St. Lawrence neighbourhood, and it’s hard to understand what going all the way to Queen (admittedly a short hop from King) would achieve beyond looking nice on a map. Much of the “sense” of the design predates the proposed redevelopment of the Unilever site at the foot of Broadview which would provide a much more direct path to the eastern waterfront line. 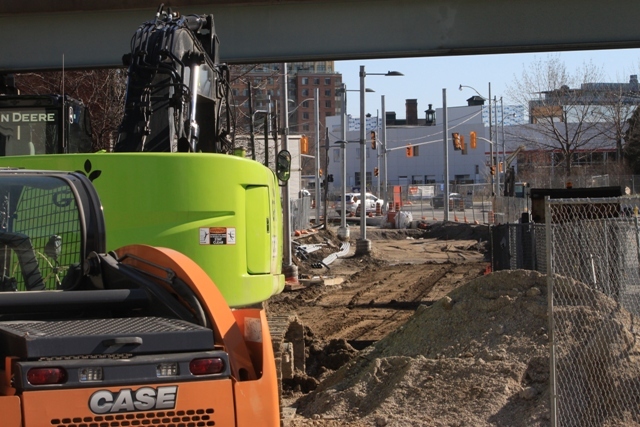 A still unresolved issue is funding to expand Cherry Street under the rail corridor so that the streetcar track can extend to and connect with the eastern waterfront lines and continue south on New Cherry Street (which does not exist yet) to the Ship Channel. This is all shown in Waterfront Toronto’s plans for the area. There is also a question of the capacity of Broadview Station and Broadview Avenue to handle substantially more streetcar traffic if that becomes a major link south from the subway. 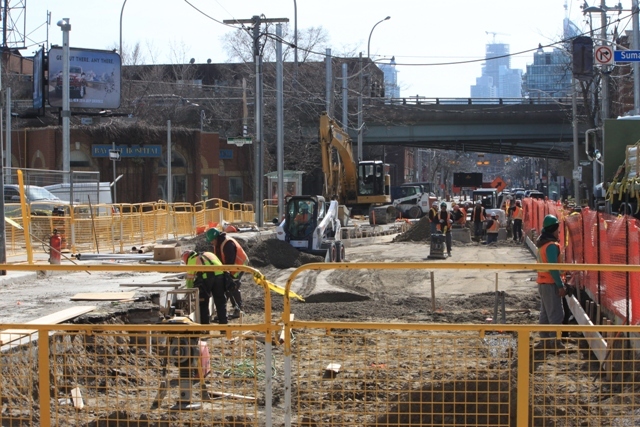 Unlike Spadina, there is no ability to create a set of private streetcar lanes on Broadview. Looks like John Tory will not only win but win with a majority of the vote share. My main question is this: is the TTC’s wish of 60 more new streetcars (correct me if I am wrong about the number) under threat with John Tory as mayor who wants to cut taxes and make government smaller? The good news about Tory’s commanding lead is that it would keep the Ford brothers out of power although I am concerned about Tory’s lack of support for our streetcars which not only provide us with good environmentally friendly transit but are also part of our history and heritage and so MUST be preserved. Which of the top 3 mayoral candidates is most streetcar friendly? Which of the top 3 candidates is most likely to build more streetcar lines such as Queens Quay East, etc? Who are you going to vote for? Steve: I suspect that either Ford Tory or Chow would support the TTC’s request for an increase in the streetcar order, but that this will be dependent more on continued support from TTC management. Being strongly pro-streetcar is a comparatively new experience for them, and everything could be turned upside down if there were a change in senior management, or if some bright spark thought that the TTC should be merged with another organization like Metrolinx. The new lines, if any are built, will be in the waterfront, and even they will be on reserved lanes, not “streetcars” in the classic downtown Toronto sense. Finch and Sheppard are both supported by Chow and Tory, as well as by Queen’s Park, although the Scarborough Liberal caucus is doing it’s worst to kill off Sheppard. The wild card here is the future of the SLRT, but with Tory as Mayor, I think that idea will be dead, unfortunately, squeezed between the subway and his SmartTrack scheme. I will likely vote for Chow as I don’t entirely trust Tory, and have been disappointed with his inflexibility. That said, Chow has had her own missteps including low-balling (and thereby undermining credibility for) her bus service plan, and making some statements about rapid transit lines Tory supports that are simply not true. Poor advice on both sides. Should that not be “either Tory or Ford”? Steve: Thanks for catching that. My brain is doing strange things some days! The wild card here is the future of the SLRT, but with Tory as Mayor, I think that idea will be dead, unfortunately, squeezed between the subway and his SmartTrack scheme. I am wondering just how much of Tory’s SmartTrack plan will get through council. Granted, it is central to his campaign in the way that the “Gravy Train” was the centre of Ford’s campaign last time around – both had the candidate say the words, “SmartTrack” now and “Gravy Train” then, in every media appearance and interview even when the topic of discussion was something else. Last time around, Ford’s “Transit Platform” was a minor thing issued late at night on a YouTube video with little though that went into it as shown by the numbers that were highly questionable and depended on a billion dollars that was already assigned to York Region. Despite that and Ford announcing the “death” of Transit City weeks after being elected, council eventually realized that THEY were needed to support or reject Ford’s plans. Though, it took them nearly two years to wake up to this. This time around, one would hope that council is a little more aware of what their powers are and can deal with debating, altering, or killing bad plans such as SmartTrack and the idea that it eliminates the need for a DMS. The fly in the ointment is just how many council members, besides Norm Kelly, can be tempted to play follow the leader and be lead over the cliff with ‘council treats’ that Tory can offer to them as mayor. Steve: The larger question is whether there is already some backroom deal between Tory and Queen’s Park on this. Given that it requires a substantial commitment of resources in the GO corridors, they can make or break the proposal. The larger question is whether there is already some backroom deal between Tory and Queen’s Park on this. Given that it requires a substantial commitment of resources in the GO corridors, they can make or break the proposal. Perhaps the “Big U” will be launched as the “SmartTrack” … in return for the “credibility” associated with the name, the unworkable Eglinton west portion (with its dubious and costly tunnel and wye) and the unrealistic capacity numbers will quietly be dropped.